Or rather occupied bandwidth. During a recent Alternative Inspection of an FM station, there was some question as to the accuracy of the modulation monitor. Truth be told, a modulation monitor is no longer required at a radio station, so long as the station ensures that they comply with relevant FCC regulations for their service. Many modulation monitors continue on, however, as air monitor receivers. That is all well and good, however, many modulation monitors are notoriously inaccurate and tend to the overly sensitive side of the equation. If used when setting the modulation levels, this can lead to under modulation, which, as we all know leads to disaster, destruction and bad ratings…. Because the volume knob on every radio in the entire metro, Total Survey Area (TSA), or even the whole country has been broken off and listeners are unable to compensate for the low audio levels from an under modulated FM transmitter. 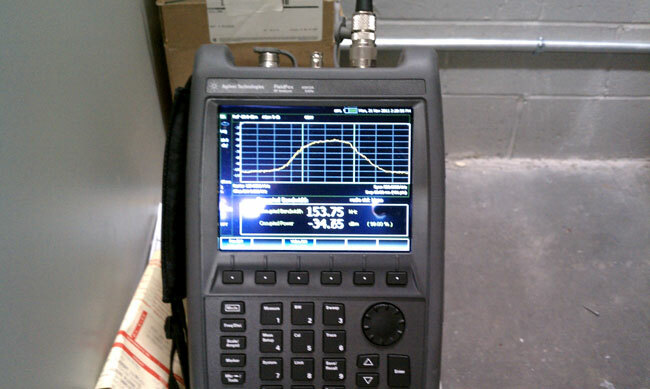 This shows that the 5 second average occupied bandwidth of 90 percent of the transmitted energy is within 153 KHz, which is slightly high but within the margin of error of the measurement device. The vertical lines represent the -10 dB signal level as referenced to the carrier. Thus this station is in compliance with FCC rules regarding modulation in spite of the face that the analog modulation monitor shows it being 10-20 percent over. Had it actually been 110 percent, the occupied bandwidth would have been 165 KHz and 120 percent would have read 180 KHz. Thus, before buying the latest squash-o-matic FM processor and setting it for full tilt boogy, a good engineer may want to check the occupied bandwidth with something other than the old analog FM modulation monitor in the rack. This shows that the 5 second average occupied bandwidth of 90 percent of the transmitted energy is within 153 KHz, which is slightly high but within the margin of error of the measurement device. Or within the RBW setting of the spectral trace? I can’t tell from the image what your RBW setting is. Also, this is the first time I’ve seen the 9912. It looks strikingly similar to the R&S FSH series of handheld spectrum analyzers (even though this Agilent unit does much more than just spectral traces).